Abbey Rosenthal and Maddie Schneider hang out before class. Varsity athletes are on varsity teams for a reason. Hard-work and determination are two of many factors that drive these individuals to success. 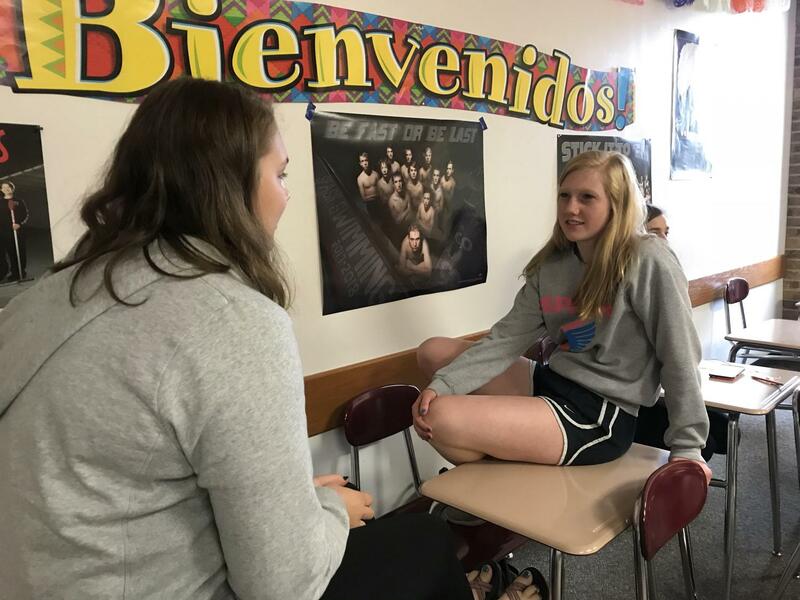 I sat down and chatted with Maddie Schneider, a junior who holds positions on the varsity team for cross country and track. I asked her some questions to get the scoop on her daily life, as well as input about her feelings on running. What got you into running and what do you love about it? What is your favorite distance for cross country? What is your favorite event in track? On a typical day, what do you eat? Do you have any specific diet? What do your meals look like on meet days? Do you do anything during offseason to train? Being a varsity athlete, that must come with a lot of pressure. Do you ever get nervous for meets? If so, how do you cope with those nerves? Any tricks or habits you follow that help you? What advice can you give people when it comes to being in varsity sports? I really liked reading an article that was written differently. I never really lost interest while reading this because it was a question and answer and I always enjoy reading those! This was a cool article, it was cool to see what Maddie does to prepare and how her day is. I really enjoyed reading this article, and I’m glad some varsity athletes still have their dignity. Unlike some I know, who get everything because their the coaches favorite. It’s refreshing to see how hard an individual has worked for something she’s loved almost all her life. Great piece. I enjoyed seeing how others prepare for their respective sport. Nice article! I liked how you went into depth about what she does to prepare and everything she does for the sport. I really enjoyed the little twist you had with a Q&A type writing style, it really kept me engaged in the article. Great job! This was an awesome story! You really helped readers get a little look inside their life! You asked great questions and it was nice to read what she had to say about each! This was a very interesting article to read and was very insightful. The things athletes do is very interesting as they have to stay in shape so everyone has their own routines and its fun to see inside some other peoples daily lives. Running is not for good health only but for soul and for personal satisfaction 😀 I have read really laaaaarge interview. You, Alyssa, did very good work, my respect! You asked her a lot of questions. And I enjoyed reading, to be honest. This was a nice article. I can relate to what Maddie does because I am also an athlete.